Chievo vs Rome Betting Tips – In the 23rd round of the A Series, Chievo receives the visit of Rome, a match that can be watched from 21:30. The two teams are not in the best form, failing to win any victory in the last 3 games played. 1. Latest information before Chievo – Rome! He is in the last position in the A Series with 9 points. In 22 stages he achieved 1 success. In the last 3 matches he has played over 2.5 goals. He has the weakest defense in the A Series, earning 44 goals so far (on a draw with Empoli). In 9 of the last 10 home games he has scored at least 1 goal. Tomovic and Seculin are unavailable. He is in the first half of the rankings. It is ranked 6th with 35 points, 1 point away from the last place of the Champions League. He has scored at least 1 goal in the last 7 matches. The team’s top scorer in the last 2 seasons of the A Series, Edin Dzeko, has a modest season so far, just registering 4 goals in 18 games played. Cristante and N’Zonzi return to the top 11 after they were suspended for the final round of the championship. Lorenzo Pellegrini is suspended for cardboard cumulation. Jesus, Under and Perotti are unavailable due to injuries. 2. Chievo – Roma likely teams! Chievo (4-1-2-1-2) – Sorrentino – Bani, Rossettini, Jaroszynski, Barba – Rigoni – Hatemai, Leris – Giaccherini – Stepinski, Djordjevic. Roma (4-2-3-1) – Olsen – Karsdorp, Manolas, Fazio, Kolarov – Cristante, N’Zonzi – Schick, Zaniolo, El Shaarawy – Dzeko. Chievo’s last victory on his own home dates back to December 16, 2012. In the game the score was 2-2. In all the matches between the two, Rome won 18 wins, Chievo won 3 times, and the remaining 14 matches ended in a draw. The clearest victory was won by Rome: 5-0, on April 28, 2002. In 6 of the last seven direct meetings, Rome has scored at least 2 goals. In each of the last two matches, El Shaarawy scored. 4.What is the shape of the teams in the last 5 games? 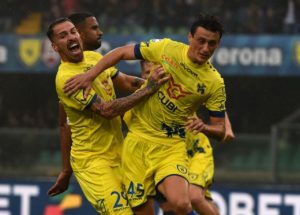 Heavy situation for Chievo, who struggles to avoid relegation this season, with only one successful victory in the 22 rounds disputed, the last position of the standings, with 9 points and a negative goal -25. Four points scored Domenico Di Carlo’s students on the Verona bench, thanks to a 1-0 victory against his newly promoted and counter-striker in the Frosinone rescue battle, and a draw from the final stage in the move at Empoli, score 2-2. Even AS Roma does not go through the best moments, after the humiliation suffered in the Italian Cup finals quarter-finals when losing 1-7 on the Fiorentina field, “giallorossi” managed only a draw at home, in the last round of the championship, 1 -1 in the company of AC Milan. Thus, although qualified in the finals of the Champions League final, where he will meet in less than a week the Portuguese champion, FC Porto, the team coached by Eusebio Di Francesco occupies the sixth position of the Serie A, with 35 points, positive golaveraj +9, balance 9 wins, 8 draws and 5 defeats. Chievo has scored at least one goal in the last 6 games played at home in all competitions. Considering the position in the leaderboard and the last 5 stages, it can be said to be an unbalanced duel, but with many goals. In the last two direct disputes, over 3.5 goals scored. Chievo scored in each of the last 6 matches played at home and received at least 1 goal in 5 of its last 6 home games. In the last game played home from Chievo against Fiorentina were scored 7 goals (3-4). In 22 stages, Chievo won most goals (on a draw with Empoli). In the last 2 stages played, Rome scored 5 goals.